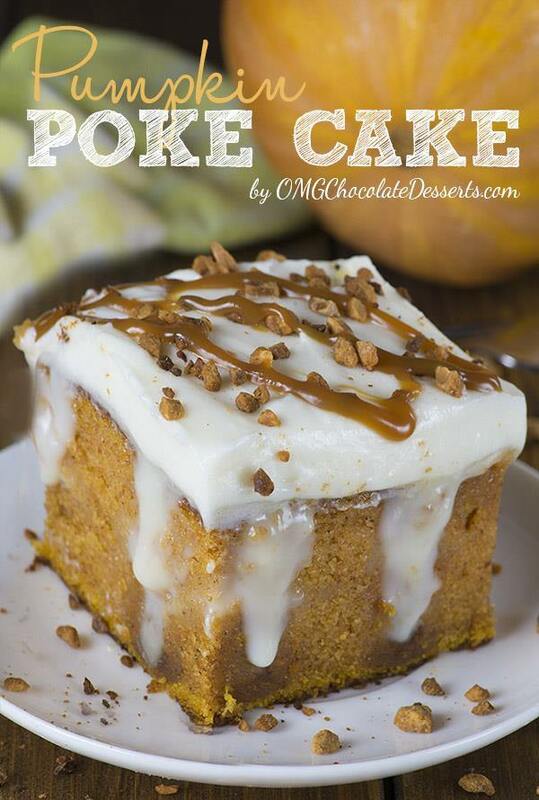 Pumpkin poke cake – the perfect desserts for the holidays. If you love classic pumpkin cake with cream cheese frosting, then you will surely love this upgraded version of the unbelievably moist Pumpkin cake filled with homemade white chocolate pudding. Although people say that “you don’t change a winning combination”, I still decided to make a step further and put a little change into this yummy cake. A little white chocolate filling can’t do any harm ;-). I have seen many times already that pumpkin and white chocolate go together brilliantly. I don’t know if you remember my recipes from last year for White Chocolate Pumpkin Cups and White Chocolate Pumpkin Truffles? First I thought that I might stir some white chocolate chips into the cake batter and with that add a little crunchy texture to this soft cake, but then, I changed my mind. It will be a very creamy and moist poke cake filled with white chocolate pudding, which will, I hope, satisfy all tastes like all chocolate poke cakes that I have made before. So, with coming holidays, Halloween and Thanksgiving Pumpkin Poke Cake is a great idea for dessert after a holiday lunch or dinner. The recipe is very simple, and for a real homemade cake, from beginning to end, you won’t need much more time then when you use boxed cake mix and canned frosting. 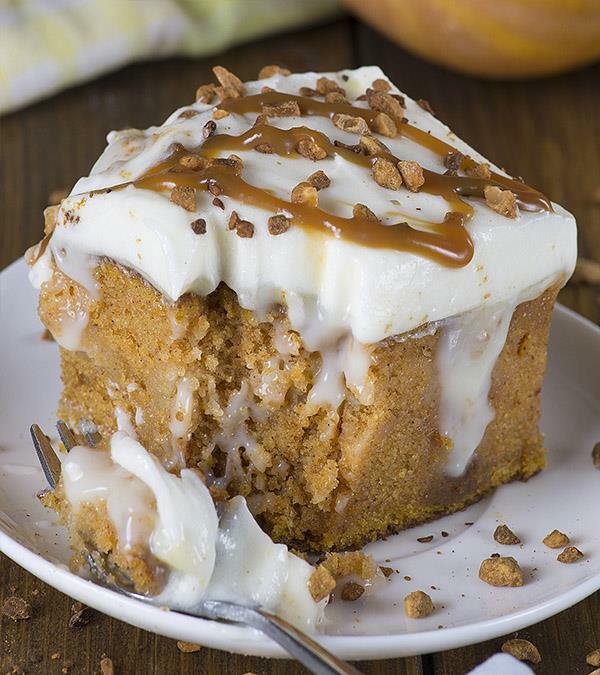 If you ask me, I’m not much of a fan of pumpkin treats, maybe this is hard to believe for you because of all the recipes I have put on this blog. When it comes to fall flavors, I’d rather have a combination of apple, cinnamon and caramel. But, this pumpkin poke cake even made me change my mind 🙂 The cake is incredibly moist and soft, it melts in your mouth and the taste of pumpkin isn’t even the overflowing one. What is your favorite fall flavor? Preheat oven to 350 F and spray 9×13 inch baking dish with non-stick cooking spray. To make the cake in a medium bowl whisk together flour, salt, cinnamon, baking powder, baking soda. In another bowl lightly beat the eggs then add sugar, oil, and pumpkin and mix to combine. Add dry ingredients mixture and beat at low speed until combined and the batter is smooth. Spread batter into pan and bake about 30 minutes (until toothpick inserted in the center comes out clean). To make the white chocolate pudding in a medium pot combine sugar and cornstarch, whisk in milk and heat over medium heat, cooking and stirring until thickened, about 3-4 minutes. Remove from heat and add in vanilla and white chocolate chips and stir well until smooth. With the end of a wooden spoon poke holes into the cake and spread warm pudding over the cake, making sure to fill all of the holes. Allow cake to cool completely before frosting. To make the frosting cream together cream cheese and butter. Add in powdered sugar a little at a time. Add in vanilla and turn mixer on medium high and mix until light and fluffy. Sprinkle with chopped toasted pecans and drizzle with caramel sauce if desired. Would this recipe work to use instant white chocolate pudding rather than making as in this recipe? The white chocolate chips are the only ingredients I don’t already have. Hi Carole, I think it will work, too.